Nach 30 Tagen erhalten Sie jeden Monat ein Hörbuch Ihrer Wahl für nur $9.99 USD. Jederzeit kündbar. Awesome reading by Michael C Hall! Although some of the language might be a bit dated (see scullery maid) I thought it was a great book to listen to and Michael C Hall brought the characters to life brilliantly! Michael C Hall brought Pet Sematary alive! I read this book years ago and enjoyed it, but the audio version is amazing! He captured the Judd Crandall's accent perfectly and the darkness and the sadness of the story really came through in the narration! 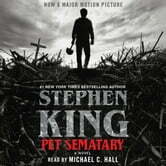 This is a must listen for any Stephen King fan!! This is only my second audiobook but loving King's work, the film made from this particular work and being a Michael C. Hall fan, I had to give it a listen. I was not disappointed. Hall kept me engaged each step of the way, particularly while reading as Jud. I've read the book as well and for whatever reason I actually pulled more from this than actually reading it. The story is tragically beautiful, if I can say that. A very human and grounded tale about the power of love and grief if it were tinted black. I highly recommend thus audiobook and this particular story in all of its forms.